The hamlet of Hartgrove in Dorset which is part of the parish of Fontmell Magna, Dorset and very near Margaret Marsh, has been the home of our ancestors from the Blachfords to the Hunts. John Blachford took over the farm at Hartgrove , Fontmell Magna, Dorset in 1759, he succeeded another John Blachford (1684-1759), who had held it by service to the lord of the manor. This is where we find Robert and Sarah (Kimber) Hunt our 6th great grandparents living in the 1740s. The Ralph's lived at Hartgrove Hill on the western edge of the parish, almost two miles from the parish church, and John Ralph, a great grandson of Charlotte Hunt(c1777), had almost drowned in the millpond at Fontmell Magna when he was aged 9, (c.1861), but had been saved by his brother Cornelius who managed to pull him out with a long stick. There were three millponds in the parish of Fontmell, as far as have been ascertained. Almost certainly the millpond where the accident happened was Woodbridge Mill, located about 300 yards over the brow of the hill from their cottage. Emily Ann Hunt was married to Tom Rose, a farmer at Bedchester, which is on the road about halfway between Hartgrove and Fontmell. It appears from earlier censuses that Tom was the son of Job and Hannah Rose. Job Rose (c.1819) in 1851 was a miller and farmer at Woodbridges, Fontmell, in the census of that year. Other ancestors who lived in Hartgrove are Susannah ( Pinhorne) Blachford,in residence 1782, Nicholas Kimber father of Sarah above, Matthew Ralph, Emmanuel Ralph, Alphaeus John Ralph, Caroline Curtis, Rachel Jane Hunt, Frederick G Hunt and Ann Mead Seymour, daughter of Morgan Seymour (c.1740). Source: Christopher Ralph, Wiltshire, UK. Another view of Hartgrove Farm, Hartgrove, Fontmell Magna, Dorset. 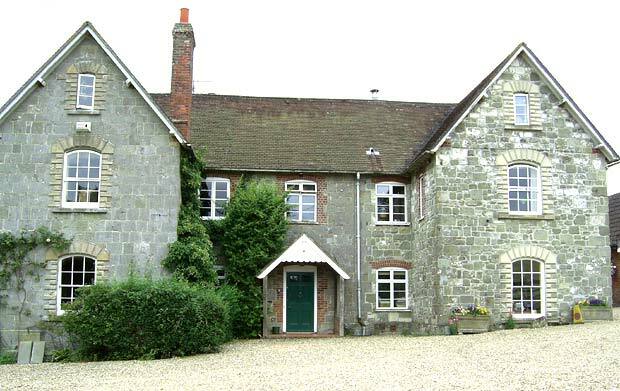 In 1831 Hartgrove was described as "HARTGROVE, a chapelry in the parish of FONTMELL-MAGNA, in that part of the hundred of SIXPENNY-HANDLEY which is in the Shaston (West) division of the county of DORSET, 4 miles (S.W. by S.) from Shaftesbury, containing 274 inhabitants. The curacy is annexed to the vicarage of Iwerne-Minster, in the archdeaconry of Dorset, and diocese of Bristol. The chapel is dedicated to St. Peter"